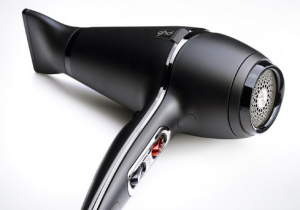 brush along the hair, following closely with the ghd air hairdryer. The nozzle of the dryer should always follow the brush continually, facing the direction of the brush. Go over the same section several times until fully dry and smooth. as you’re drying your thumb is pushing on the cold air to seal the cuticle. This gives amazing shine, longevity and an incredible hold. Tackling the front section of the hair is definitely the most difficult part of blow-drying, particularly if you have shorter pieces around the front. Go slightly smaller on your brush for this section, I recommend the ghd ceramic vented radial brush, size 2. Or, if you find it really hard to control, this is where you would go for a bristle brush like the ghd natural bristle radial brush, size 2. The bristle will help to gently smooth the hair out and make it as easy as possible. Finally, to get rid of flyways apply ghd final fix hairspray on fingers (never apply hairspray directly onto the hair!) and gently press the hairspray onto the roots using your palms. Start at the parting and then smooth out. Then, take your ghd gold styler and just using the warmth of the back of the styler smooth down any flyaway hairs at the root. The heat of the styler warms the resins in the hairspray and sets it into the hair. This makes the hair last a good few days, feeling healthy, glossy and plus using a super easy guide!